If Kareena’s look in Tashan wasn’t quite glam, the upcoming Kambakkht Ishq will see the actress ooze loads of oomph and style. 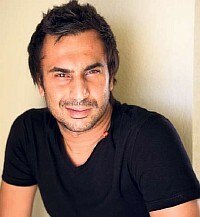 According to designer Aki Narula, it took many months of research to create the right look for Bebo. “While working on Kareena’s international look, I also had to keep in mind the fashion trends and forecasts for summer 2009 since the movie releases around that time. I also made Kareena try all the clothes I picked up for her before shooting started. So, she knew exactly what to wear for different shots,” says Aki. In Kambakkht Ishq, Kareena will wear a number of short dresses with a great deal of mismatch. “I’ve used colour blocking to create a clean, trendy and ultra-stylish look. In addition, there are 52 pairs of footwear with five-inch heels that Kareena has worn in the movie. There are also bags in colours like yellow and purple,” says Aki. Kareena Kapoor on the cover of OK!